Frederick A. Mitchell, Minister for Foreign Affairs and Immigration of the Commonwealth of the Bahamas, addresses the general debate of the General Assembly’s seventy-first session. Declaring that Caribbean countries are being treated “as if they are hell on earth” due to new financial rules against tax havens, Bahamian Foreign Minister Frederick Mitchell mounted the podium of the United Nations General Assembly today to denounce the “immoral” withdrawal of normal banking services that inflict hardship on ordinary citizens. “This problem must be solved by those who imposed the regulations. It is a moral imperative,” he told the Assembly’s annual general debate, reprising a theme already highlighted by fellow leaders from the Caribbean Community and Common Market (CARICOM) last week. Foreign Minister Wilfred Elrington of Belize endorsed other CARICOM delegations in their pleas for “urgent relief from the deleterious consequences of the decisions of global banks to withdraw banking services. “We keep upgrading our regulatory frameworks to ensure strict compliance with all relevant laws and best practices of the banking and financial sectors internationally,” he said. Trinidad and Tobago Foreign Minister Dennis Moses focused his address on the UN’s role in attaining the 2030 Agenda and tackling other challenges facing the world. “From the existential hazard posed by unmitigated climate change, to the insidious threat of violent extremism and terrorism; the crises of forced displacement and the spread of infectious diseases and illnesses such as Ebola, Chikungunya and Zika, it is clear that the challenges of our time far exceed the limits of geography and demography, and therefore diminishes the efficacy of unilateral responses,” he told the Assembly. Foreign Minister Niermala Badrising of Suriname also stressed the primacy of the UN in achieving the Sustainable Development Goals (SDGs) and combatting climate change. “As we continue our deliberations and take decisions on pertinent issues with respect to the global agenda, the world finds itself at elevated levels of crises: financially, economically, environmentally and politically,” she said, calling this the opposite of what is needed for sustainable development for all, namely peace, stability, democracy and universal access to the planet's resources. 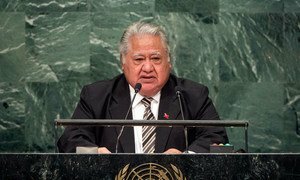 Addressing the annual debate of world leaders at the United Nations General Assembly, leaders from Pacific Small Island Developing States underlined today the urgency of strong and committed action on the global pledges made for the planet and its people.